Bacteria utilize both organic and inorganic substances as electron sources for their metabolic activities. Interestingly, our recent studies demonstrate that certain phototrophic bacteria, such as Rhodopseudomonas palustris TIE-1, can use electrically-charged surfaces (cathode) as the source of electrons. Furthermore, by applying an electron transfer mediator on the electrically charged surface, we can enhance TIE-1’s ability to consume electrons by about four-fold (1.47 ± 0.04 to 5.6 ± 0.09 µA/cm2). TIE-1 is a freshwater bacterium that can utilize soluble, gaseous and insoluble compounds as electron sources for photosynthesis. We investigated the mechanisms by which this bacterium takes up electrons from both soluble and insoluble iron-based materials. We supplied current to TIE-1 under a constant potential through conductive graphite surfaces (cathode) in the presence of both soluble iron as ferrous chloride and, insoluble iron complex as ferrous-ferric polynuclear chemical complex or Prussian blue. Our experimental results reveal that TIE-1 can take up electrons from soluble iron irrespective of the presence of electrically charged graphite (cathode). Under these conditions, TIE-1 performs photoferrotrophy, the process by which inorganic carbon is fixed into organic matter using light as an energy source and reduced iron [Fe(II)] as an electron donor. Similarly, when we provide only the electrically-charged graphite as the source of electrons, TIE-1 can directly take up electrons from the charged graphite via a process called extracellular electron transfer or EET through photoelectroautotrophy. This is the process where CO2 is fixed in presence of light by using the electrically charged surface as an electron donor. Interestingly, when we used the insoluble iron complex deposited graphite as the source of electrons, we observed the enhancement in electron donation (in terms of current quantity) to TIE-1 and the insoluble iron complex recharged itself cyclically by the applied electrical potential. This result indicates that the insoluble iron complex deposited on graphite electrode can act as a mediator while enhancing EET between the charged graphite surface and TIE-1. Overall, our data show that an immobilized, insoluble and low cost (<$1 per Kg) iron complex can enhance EET by TIE-1. In addition to that, the insoluble iron complex is very useful for improving microbial electrosynthesis, the process where microbes can take up electrons either directly or indirectly from electricity to make useful biochemical products. 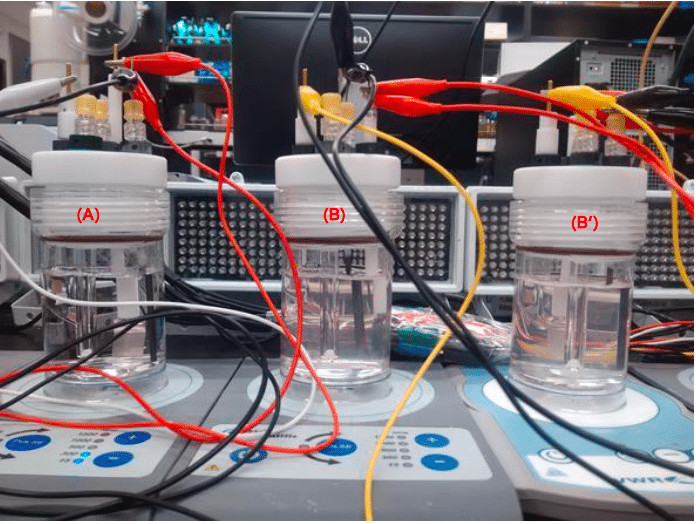 These findings are described in the article entitled An insoluble iron complex coated cathode enhances direct electron uptake by Rhodopseudomonas palustris TIE-1, recently published in the journal Bioelectrochemistry. This work was conducted by Karthikeyan Rengasamy, Tahina Ranaivoarisoa, Rajesh Singh, and Arpita Bose from Washington University in Saint Louis. K. Rengasamy, T. Ranaivoarisoa, R. Singh, A. Bose, An insoluble iron complex coated cathode enhances direct electron uptake by Rhodopseudomonas palustris TIE-1, Bioelectrochemistry, 122 (2018) 164-173. 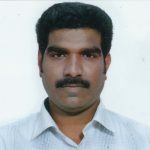 Karthikeyan is a postdoctoral scientist at Washington University Saint Louis. Arpita Bose's lab studies microbial metabolisms and their influence on biogeochemical cycling using an interdisciplinary approach. She seeks to generate new ways of addressing issues such as the energy crisis, pollution, biofouling, and sustainability.